Successfully Added Mobile Phone Watch with Back Lit Keypad Strap to your Shopping Cart. Just when you thought our selection of cell phone watches couldn't get any cooler, we've out done ourselves by securing this awesome model with a back lit keypad built into the strap. You can simply make quick calls by dialing the number on the keypad strap, and when you need to do some more serious activity like using the organizer you can take out the handy mini stylus. All the media features you've come to expect are here too, with A2DP Bluetooth, video camera MP3 player and high resolution still camera. 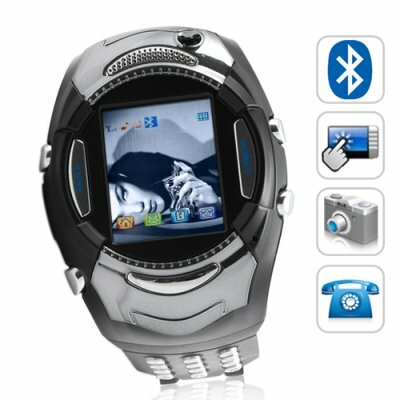 Now there's are phone watch for everyone, get yours now only from your favorite wholesaler - Chinavasion. NOTE: This product is compatible with GSM at 900MHz, 1800MHz, 1900MHz. Please check with your cellular provider if you are unsure of your local GSM frequency. This is a tri-band mobile phone that will work in most parts of the world. Please check the link above to GSMWorld if you have questions about which band(s) your carrier uses. I received the phone and was all that was promised even better! Not only is this a great watch, that can be used as a bluetooth media center but it is also a phone! The keypad on the band makes it easy to use and the two way metal strap means it dosn't catch an anything! All in all a fantastic piece of tech!